이 어플은 원하지 않는 시간대에 오는 문자, 전화, 알림을 모두 하지 못하도록 합니다. 또는 즉시 무음모드로 변경할 수도 있습니다. 밤시간대에 오는 전화, 문자, 알림등을 차단해서 숙면을 하는데 도움을 줍니다. No Disturb application allows users to mute all incoming notifications to calls, texts and other intrusions from interrupting during a schedule or when users turn No Disturb on. This app certainly prevents late night wake ups from noisy notifications. 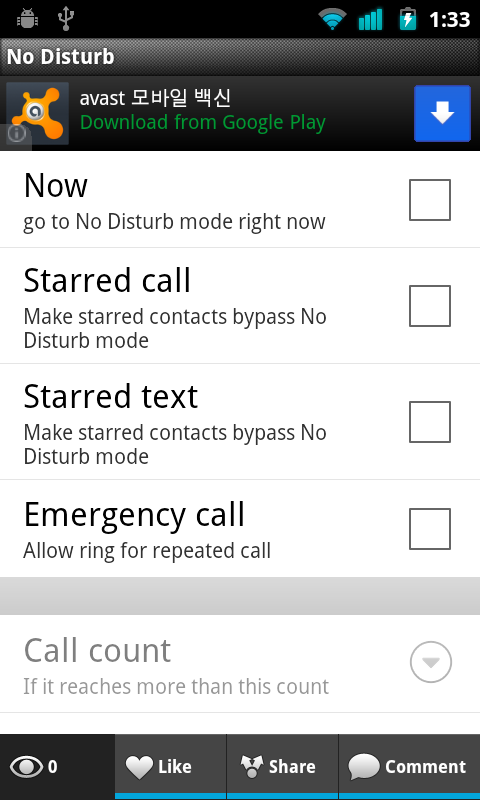 - Choose to allow incoming call or text from starred contacts. - Option enables emergency call which is repeatedly called certain times within certain timeout is allowed to ring, even in No Disturb mode. 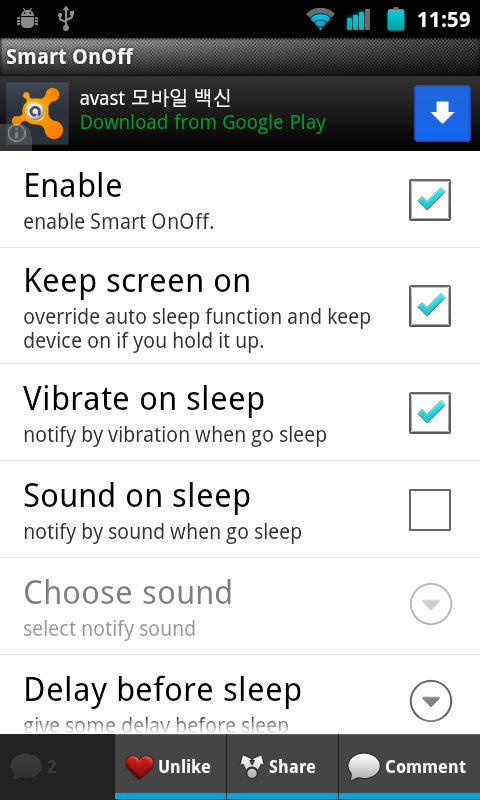 - Can schedule auto switching No Disturb mode, between day and night. 이 어플로 삼성의 스마트스테이와 비슷한 기능을 이용할 수 있습니다. 폰을 들고 보고 있을때는 꺼지지 않고 눕히면 꺼집니다. 삼성의 그것과 같이 카메라를 이용하지 않고 G-센서를 이용해서 밧데리 소모가 더 적습니다. 그리고 더욱 많은 폰들을 지원할 수 있습니다. 전원버튼을 누르지 않고 폰을 끌 수 있어서 실생활에 편리합니다. 모든 권한은 광고의 표시나 장치를 끄는데만 쓰입니다. Operation like Samsung's SmartStay is possible with this app. You can make phone not going to sleep when you hold it up but go sleep lay it down. It does not use camera to decide it's status but use g-sensor so consumes less battery and can support phones which do not have SmartStay capability as many phones do. When you reading or in daily life this could be very convenient because you don't even need to look for power button every time to turn it off. Just flip it! By default, it was set to be off on Face Up, if you put down phone on the desk, show notification icon for wait period of 2 seconds, then screen will be off. Notification icon will be removed as soon as the phone is out of level position such as if you hold it up, so it should stay still for designated seconds to be turned off. The waiting period is adjustable even to None which will turn it off as fast as possible. Opinions are always welcome.